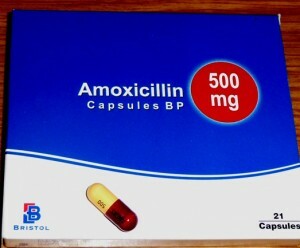 Amoxicillin is one of the widely prescribed antibacterial agents and is most commonly marketed under the brand name Amoxil. This medication belongs to the penicillin group of drugs and kills bacteria in the body by preventing them from forming cell walls. This causes the bacteria to eventually die and thus heals the infection. Originally, SmithKline Beecham was the sole manufacturer of Amoxicillin but after the expiration of its patent in 1998, different pharmaceutical companies have started producing it. Currently, amoxicillin is sold as a generic medicine as well as brand medicine under different trade names that include Amoxicillin, Amoxil, Dispermox, Moxatag, and Trimox. Some pharmaceutical firms that manufacture amoxicillin include GlaxoSmithKline, Ranbaxy, MiddleBrook Pharms, SmeethKline Beecham, and Teva. Amoxicillin is available both as oral and parenteral medication and in 250 mg and 500 mg capsules, 500 mg or 875 mg tablets, and 125 mg, 200 mg, 250 mg and 400 mg oral suspensions. It is important to follow the prescribed dosage of Amoxicillin exactly. You must complete your medication even if your symptoms go away to ensure that the bacteria is completely killed. Amoxil works best when it is taken at evenly spaced intervals so it is consistently present in your body throughout the course of the treatment. Amoxicillin is exclusively used for the treatment of bacterial infections including infections of the ear, nose, throat, sinuses, lower respiratory tract and urinary tract. It will not treat infections caused by virus such as flu and common colds. Improper or unnecessary use of this medication can decrease its effectiveness. Amoxicillin is also prescribed as an adjunctive medication in the treatment of intestinal and stomach ulcers resulting from overproduction of H. pylori and gonorrhea. It also prevents recurrence of gastrointestinal ulcers. Some healthcare providers also prescribe this medication for certain heart problems and as a prophylactic treatment before dental/medical procedure to prevent bacterial infection of the heart valve. It is also sometimes used to treat Lyme disease and Typhoid fever as well as to prevent infections in the newborn caused by group B streptococcus. This drug must be used for these ‘off-label’ medical purposes only if it has been recommended by your healthcare provider. Amoxicillin oral is dispensed as a tablet, a chewable tablet, a capsule, a suspension (liquid preparation), and pediatric drops. It should be taken by mouth every 8 hours (three times a day) or 12 hours (two times a day) depending on the physician’s prescription. It can be taken with or without food. It is best to take this medication during the same time of the day. Make sure that you carefully read the prescription label and take the drug exactly as directed. For suspensions and pediatric drops, shake the bottle properly to distribute the medication evenly. Measure the dose using the bottle dropper that comes with the medication. To minimize the unpleasant taste amoxicillin suspension or pediatrics, particularly in children, it can be taken along with water, fruit juice, ginger ale or other cold liquid. Tablets and capsules should be taken whole along with a full glass of water. On the other hand, chewable tablets must be chewed or crushed thoroughly before they are swallowed. Do not discontinue taking the drug even if you start feeling well. It is important that you complete the entire treatment course. Discontinuing amoxicillin before the prescribed treatment duration can cause bacterial resistance and return of the infection. Taking amoxicillin for longer than recommended can also lead to drug resistance. Make sure that you follow the prescription properly. Contact your physician right away if your symptoms persist or get worse after initiating treatment.